Home/Articles/INJURY DUE TO A SLIP AND FALL OR TRIP AND FALL IN NEW ORLEANS OR METAIRIE, LOUISIANA? Have you suffered an injury due to a slip and fall or trip and fall in New Orleans or Metairie, Louisiana? Our attorney, Vincent “Trey” Glorioso, III, can help you decide if you have a case and help you get the money you deserve for your injuries. Contact The Glorioso Law Firm now for a free consultation. We work on a contingency fee basis which means that if we don’t collect money for you then we don’t charge you a fee. Are you wondering if you have a good or winnable slip and fall case? In order to win a slip and fall case your attorney will have to prove two main things: liability and damages. Liability is the legal term for proving that someone was at fault and therefore responsible. In a slip and fall case in Louisiana there are many things you have to prove in order to establish liability. One of the most often litigated issues is whether the defendant had notice. That is, you must prove that the defendant in your case either created the dangerous condition or that they knew or should have known of the dangerous condition. There are a lot of ways in which The Glorioso Law Firm goes about proving notice. Along with proving that a defendant had a legal duty and that the defendant breached that duty, The Glorioso Law Firm has the experience, resources and skill to get you the money you deserve. Please see the top 5 things you should do if you slip and fall to help with proving liability. In most cases if you can show proof of when and how you fell along with pictures of the thing that caused you to fall, you have a good chance of winning a slip and fall case. However, proving liability is just the first step in having a winning slip and fall case. In addition to liability, you must prove that the fault of the defendant caused you to suffer some damage. Damage is usually some type of injury in a slip and fall case. Louisiana law requires that you prove damages. Damages can be anything from broken arms and legs, concussions, facial fractures, spinal cord injuries or even death. It is important that you seek immediate medical attention after a slip and fall incident. In Louisiana, the compensation you receive will be based on the severity and duration of your injury. That is, how bad is your pain and how long did your pain last. Contact us today for a free consultation and evaluation of your slip and fall case. 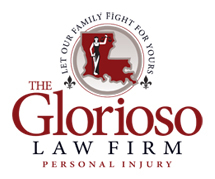 In a New Orleans slip and fall case successfully resolved by The Glorioso Law Firm, a very nice lady was entering her place of employment in New Orleans East. As she was walking through the doorway she slipped and fell breaking her hip which required surgery. After investigating the cause of the fall and taking multiple depositions, The Glorioso Law Firm was able to prove that the building owner’s cleaning company was liable for negligence in allowing an unreasonable wax build up on the inside of the building at the entrance where the plaintiff fell. “Notice” was shown by proving that the cleaning companies inspection policy was violated and that if the policy would have followed the accident would not have occurred. After setting the case for a jury trial, we began serious settlement discussions and negotiations. Before a jury was selected, we were able to get this nice lady’s slip and fall case settled for $400,000. REMEMBER – IF YOU SLIP AND FALL, GIVE US A CALL!